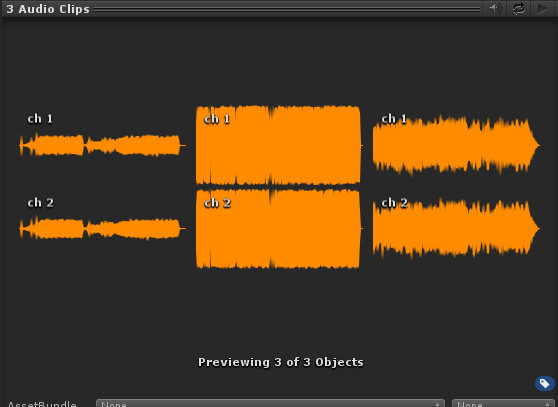 As you can see, the amplitude differs drastically from clip to clip, subsequently creating levels that are trivial to complete or almost impossible. I want to find a way to determine this "loudness" so I can tone it down or amplify it with a multiplier after getting the data from the song. Also, is there a way to extract this data without playing the song? A manual way to do that is to use AudioClip.GetData to get the sample data in an array. Then loop through the data and find the Root Mean Square to find the "loudness" of the audio clip. You can also then scale the whole array so that the maximum value is 1.0f and write it back to the audioclip with AudioClip.SetData. This is called normalizing audio, and it makes samples have the loudest point to max volume. Note that this does not take in to account that if your audio clips are very low volume, but have very high peaks. There are more advanced techniques for that (noted below). Unity also is doing normalization automatically by default. So if you have not touched the import settings, this operation is done automatically and you do not need to worry about it. If you still have the issue even though you are sure the audio is normalized, you then probably need to compress the audio with dynamic range compression (note: very different thing from data compression, has nothing to do with file sizes or memory usage) to fit your needs with external software. Not the answer you're looking for? Browse other questions tagged unity c# audio or ask your own question.